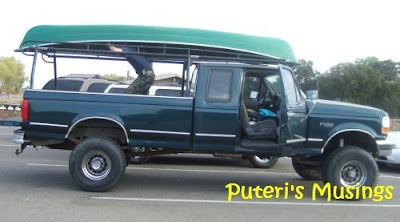 Some weeks ago, Doug bought a used canoe. 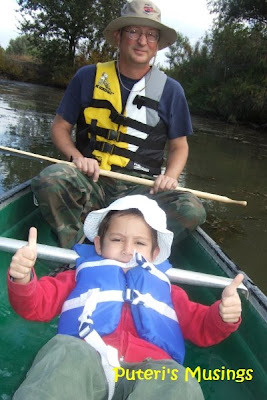 He couldn't wait to take the canoe out on a river. 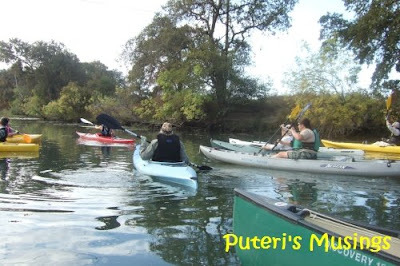 He had heard about canoeing and kayaking on the Cosumnes River Preserve and a couple of weeks ago, he and the kids checked out the area and came home with a list of activities that go on at the Preserve. 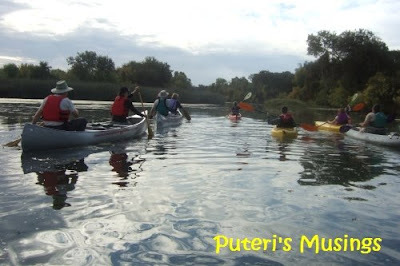 Among the activities that are carried out regularly at the Preserve is a monthly guided tour of the river. 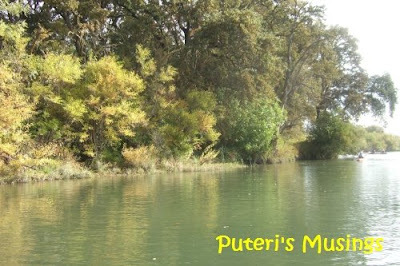 Today was the last of the guided river tour for the year. 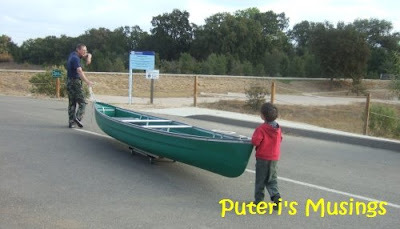 Doug unloading the canoe at the car park of the Visitor Center at the Cosumnes River Preserve. I thought we were late but there were several people arriving at about the same time as we did. 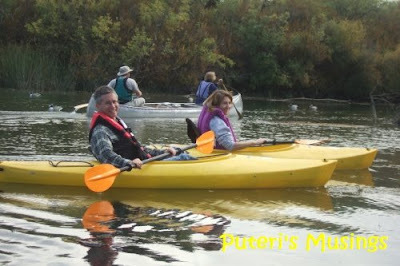 Our friends, Richard and Kathy brought their kayaks. I did not know that Kathy could kayak! Duncan ran off to meet them when he saw them. 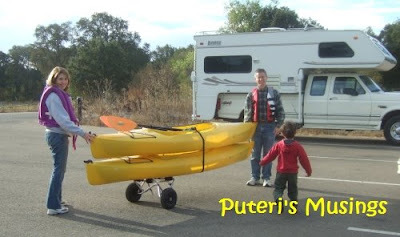 Doug modified a furniture moving dolly for moving his canoe. The dolly works well eh! 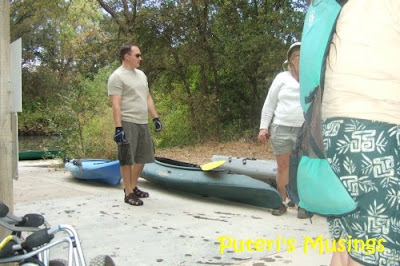 Though next time we should get a proper one, like the one that Kathy and Richard used to move their kayaks. There were about 15 canoes and kayaks. 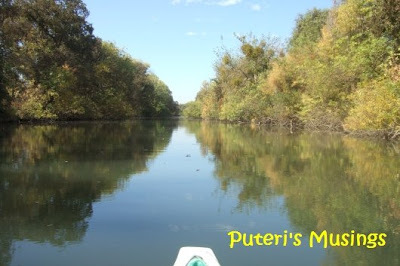 I have not paddled anything in a long, long time, and we sort of zigged-zagged our way along the river! Doug claims he knows how to steer a boat, but in my estimation, he wasn't all that good! Good thing the canoes and kayaks are light crafts and when we bumped into each other, all one had to do was just push the other canoe/kayak away. 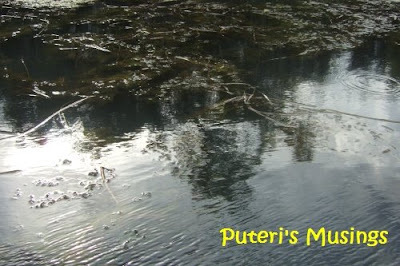 The rive was quite placid, and the scenery along the river was quite spectacular. 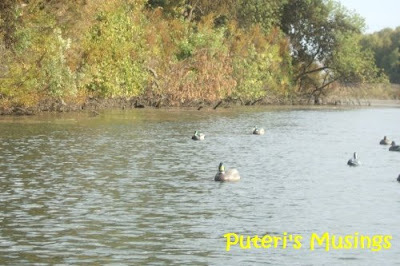 Ducks on the river? 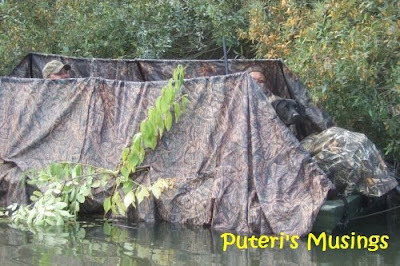 No, those are decoys! Those decoys look pretty real, don't they? 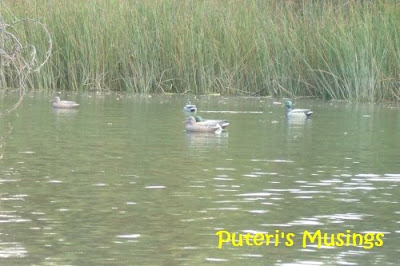 It is duck hunting season and we came across two groups of duck hunters. Of course our tour leader made sure he went ahead of us to warn the hunters that a group of people were paddling along the river. I thought the hunters camouflaged themselves pretty well! I did not notice they were there till I was really close to them! There was a couple and their dog on this well-camouflaged boat. 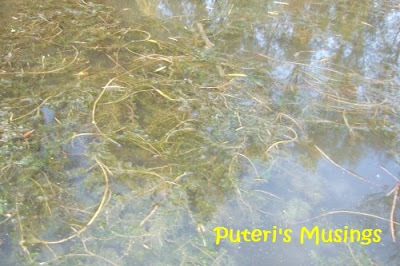 At some parts of the river, there were some thick vegetation. Seaweeds or what? I don't exactly know what they are called, but Doug doesn't think they are kelp because kelp grows in sea water. Kathy and Richard on their kayaks. The kayakers can move a lot faster than us. Er, actually the others on the canoes also moved a lot faster than us! Thumbs up from the kid who squirmed so much that I felt like hitting him with my paddle! I do not like being on a boat that rocks too much! Denice chose not to come with us. She is just too afraid of being on a boat and on the water. We left her at home with two baby sitters minding her. 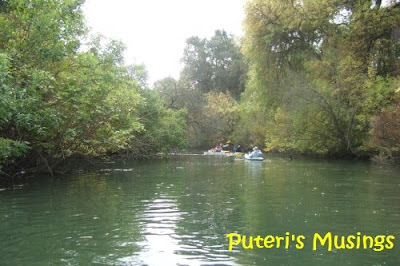 We stopped and got out of our canoes and kayaks at one spot. Doug rocked the canoe too much as he tried to get out and he fell into the water. Yup, that's Doug all wet! The water was cold but not that cold! His cell phone and wallet got wet. But fortunately the phone still works. Even though we started off before everybody else after that short stop, everyone passed us after a while! We spent about three and a half hours on the river. This is the scene after the river tour. 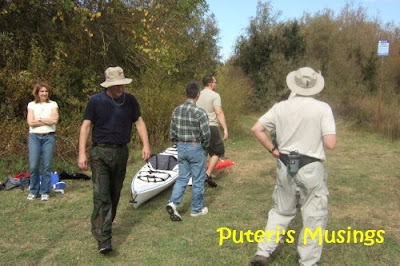 I enjoyed the canoeing very much and look forward to more. 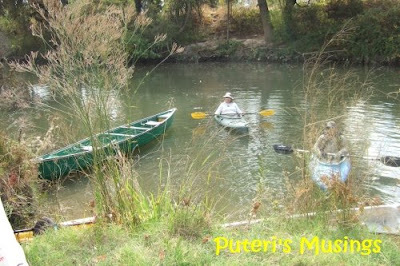 Doug says canoeing is good exercise for me. Yeah, but now my left shoulder hurts and I feel some arthritic pain from my shoulder down to my elbows! there is a disco ganster fight in miri? what happened? why no report in mcnet? I was the photographer, so can't include myself in the picture! I tried with my camera phone but they were very nice .. too much double chin! Kekeke! My friend, Richard, did take a few pictures of us, but I have yet to see them. I can't swim, so where water sports are concerned I am very cautious. But that kid can't swim and he is not afraid of anything! Good thing they made every wear life vests ... don't want the liability of course! Aiyo, NOT very nice, I mean!